We got five of the ten Shocklands last time, and this time we have the remaining five. They didn’t release them according to allied/enemy color pairs, so it’s a mixed back. If you’re looking for your own set of the shocks (like I was at the beginning of last year, and purchased a full set) now is the time to get them. They were at all time lows with the reprints (and thankfully the reprints didn’t tank the costs of my older copies) and now you can get a full set at a cheaper price. I intend on getting at least one more full set for my own collection. They are especially good in cEDH decks, so if you want to step up your game don’t hesitate to grab them. As with Guilds of Ravnica before it, Ravnica: Allegiance has the majority of the good cards from the set in the multi-colored category. There’s some really good stuff here, from new legendary creatures with really nice effects, to Enchantments and even Sorceries that look good. I’m particularly into the new Teysa, as she adds a new Panharmonicon-like effect that triggers off of creatures dying. I also really like Prime Speaker Vannifar because she’s Birthing Pod on a stick. High Alert is a nice redundancy for my Arcades deck, like Assault Formation and Rolling Stones before it. The new simic mana dork (Gyre Engineer) is nice. Kaya’s Wrath is another Wrath of God style board wipe in good colors. Captive Audience is just mean, and the type of thing that makes me want to brew a Rakdos deck. Gruul got some great cards too, with Nikya of the Old Ways being nice ramp for creature heavy decks, and Rhythm of the Wild stopping said creatures from being countered along with giving them all Riot so you can abuse +1/+1 counter synergies or give everything haste. Good stuff all around. I really like Smothering Tithe. It’s more ramp for a color that desperately needs it, and if you’re against someone with a good card draw engine, you could potentially end up with a bunch of treasure artifacts or at least slow them down due to the taxing effect. I might find room for this enchantment in my stax deck. Shield Formation is a nice way to counter a board wipe, and the Angel, while expensive is still a nice way to prevent yourself from losing the game. I feel like Blue gets all the love most of the time, and there are some great cards here. Mass Manipulation is the first theft card I’ve seen that can also target Planeswalkers, and though it is expensive, mono-blue decks shouldn’t have trouble finding four blue mana. Essence Capture is a counter spell that I’d like in my Merfolk deck due to the +1/+1 counter synergy. Verity Circle would be great against Azami decks who tap creatures constantly without using them to attack — a ton of card advantage for little cost. The merfolk card looks good for merfolk decks especially having the adapt keyword, and if you can make more counters you’re looting more often. The Sphinx is cool because you can scry early if its in your opening hand, but also just provides a static scry per turn and card selection is always nice. First we got Firesong and Sunspeaker that gave our instants and sorceries lifelink. Now we have the Pestilent Spirit that gives these spells deathtouch. I really like this card but haven’t figured out where to put it so you can break it. I’d say most likely the best in a Rakdos deck mainly because you’ll probably run some burn spells, but I’m sure it could be used elsewhere to great effect. Awaken the Erstwhile is interesting as it clears players hands, but it could backfire as it will create 2/2 zombies for each card discarded. It’s a nice flavor for zombie decks, but you’d probably want to have the most cards in hand when you cast it. Lastly, Font of Agonies is an interesting card. I’m debating if this can find a place in my Zur deck, as it looks nice in conjuction with Necropotence. Each time you pay life to activate the card draw for Necropotence, you’ll get blood counters on the Font, and then can pay 1B and remove four blood counters to destroy a creature. A nice way to control things while digging for wincons. 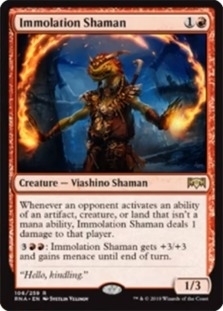 Immolation Shaman is a nice hate bear. A 1/3 for two mana, he’s easy to get on the board, and he punishes the activation of abilities by allowing you to ping the player who does so. He also has some built-in protection by letting you beef him up if some direct damage comes his way. 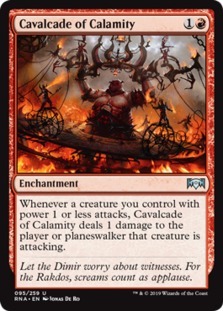 I’m really into Cavalcade of Calamity though, and think I’ll be slotting it into my Krenko deck. Since Krenko makes a ton of 1/1 goblins, this essentially doubles up that damage by hitting the player for the 1 damage for each attacking goblin. This is doubly nice because that damage will get through regardless of if the goblin is blocked. Craterhoof Behemoth now has a little brother. The End-Raze Forerunners are expensive, but give a mini version of the same buff that Craterhoof does. Nice redundancy for decks that want this effect. The Wayfinder is a nice bit of card selection for green decks, and Wilderness Reclamation is a great way to make sure you always have mana up. Probably not a great option for mono green decks, but if you need mana left up for counterspells, it’s awesome. Not a huge amount of good artifacts in this set, but I do like a couple of them. Junktroller is a nice reprint as it is used in decks like Grenzo. The Sphinx is interesting, as it is all colors despite technically being colorless, but it has Hexproof from monocolored, so it basically can’t be removed by a bunch of removal that is out there. Finally, the Tome of the Guildpact is a nice little rock for decks that use a bunch of multi-colored spells. It’s a bit costly, but it does add mana of any color, and gets you a bit of card draw for those multi-colored spells. I’d add it in if you have a good selection of these types of cards. So there you have it. Another new set is coming, and it looks good. I’m still wanting to spend more money of Ultimate Masters personally, but if possible I’ll be trying to go to this pre-release. What cards are you excited for from this set?